Etuini Haloti Ngata is an American football nose tackle and defensive end for the Baltimore Ravens. He is one of the highest paid NFL defensive linemen. Ngata was born January 21, 1984, in Inglewood, California. His father, Solomone, and his mother, ‘Ofa, moved from Tonga to Southern California in the early 1970s, and then moved their family to Utah in 1990. Solomone Ngata was athletic and boxed and played rugby. He worked two jobs but made time to play ball with his sons when he was home. Ngata played rugby at Highland High School in Salt Lake City, Utah, and helped lead the Highland Rugby Club to the National Rugby Championship. He was also a three-year starter on the defensive line. His senior year he recorded over 200 tackles and led his team to the state quarterfinals. He was named the 2001 Utah Gatorade Player of the Year and a first-team USA Today All-USA selection. He played in the 2002 U.S. Army All-American Bowl. As a member of The Church of Jesus Christ of Latter-day Saints, Ngata felt most at home at Brigham Young University but chose the University of Oregon over BYU, University of Nebraska, Texas A&M, and University of Washington. He was considered one of the best players in college football. He was a second-team All-Pac-10 selection in 2004 and a first-team All-Pac-10 selection in 2005. Following his senior season in 2005, he was recognized as the Pac-10 Defensive Player of the Year and a consensus first-team All-American, Oregon's first in 43 years. Ngata also earned praise as a dangerous special teams player, blocking seven kicks during his three-years at Oregon. Ngata’s father died in a traffic accident in December 2002 while Ngata was playing football at the University of Oregon. His father was able to watch his son play 12 games at Oregon before his death. Ngata left college ball a year early when his mother was in the early stages of kidney dialysis. She died on January 13, 2006. 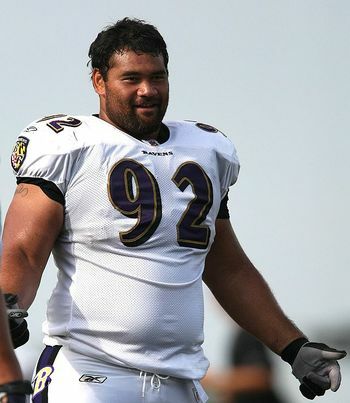 The Baltimore Ravens picked Ngata in the first round of the 2006 NFL Draft with the 12th overall pick. On July 28, 2006, Ngata signed a five-year contract with the Ravens, worth up to $14 million. On February 15, 2011, the Ravens placed their franchise tag on Ngata and on September 20, he signed a five-year contract worth $61 million. He has been selected for the Pro Bowl five times. Ngata says he learned his work ethic from his father who took Haloti and his brothers (two older brothers, one younger) along on his construction jobs. He has one younger sister. Ngata was named after his maternal uncle, Haloti Moala-Liava’a, who was a middle linebacker for the University of Utah Utes. Ngata's extended family includes several athletes. One of his cousins, Tevita Moala, was a starting linebacker on Oregon State’s 2000 Fiesta Bowl team. Another cousin, Fili Moala, was an All-American defensive lineman at the University of Southern California (2004–2008) and now plays for the Indianapolis Colts. Ngata married Christina Adams in June 2007. As of 2014 they are the parents of two sons, Solomon and Maximus. They live in Maryland. This page was last edited on 13 June 2014, at 15:01.